There is nothing like the original. The first four-wheel-drive vehicle created specifically to be able to go anywhere and do anything was the Jeep, created in 1941 for the United States to help during combat in World War II. Veterans loved the vehicle so much, Willys-Overland began producing models for civilian use at war’s end in 1945. After 76 years, the newest Jeeps still carry some of the iconic design cues created by Delmar Roos. Whereas the originals were created virtually overnight for rugged off-road military use, new Wranglers can go places the originals could not. Yet, they are as comfortable as modern sedans for on-road use as well. 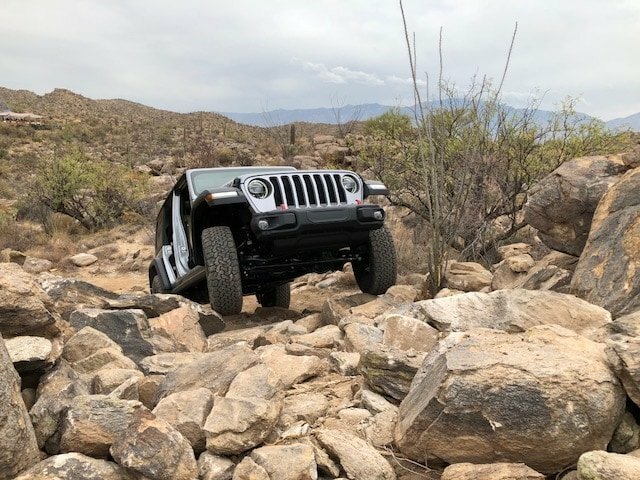 I had the honor of test driving the 2018 Wrangler and Wrangler Rubicon on both Arizona freeways and in mountainous terrain, so rugged I could not have walked it without falling. Were I blindfolded, I would not have known I was riding in a Wrangler. FCA has added so many refinements that even someone who purchased a Wrangler in 2017 will eye the new 2018 model with lust in their heart. There are so many innovative features in the 2018 Jeep Wrangler. I was really impressed with this special key slot inbetween the cup holders. I thought it so brilliant, I had to take a photo to prove it was actually there. The interior features more comfort, convenience and technology than ever before. The fourth generation UConnect system provides hands-free communication, entertainment and navigation features with three different available screen sizes (5”, 7” and 8.4”). The two larger screens can be controlled by touch with pinch, tap and swipe capability. While driving and riding in the new Rubicon, the display was so bright, even with the glare of the bright Arizona sun, it was as if I was at home watching an HD television screen. 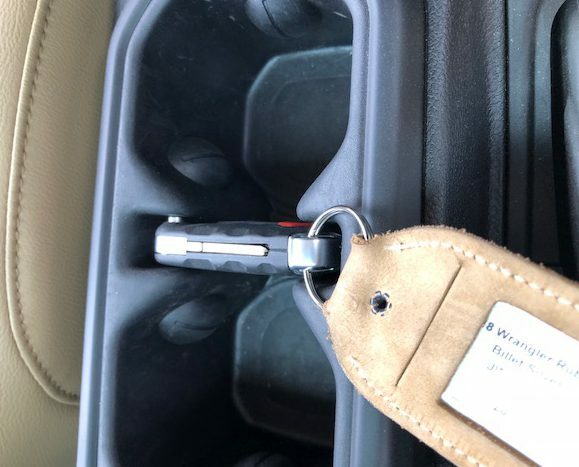 One common complaint I hear from journalists and consumers alike is that many new vehicles do not have enough USB and connectivity ports. 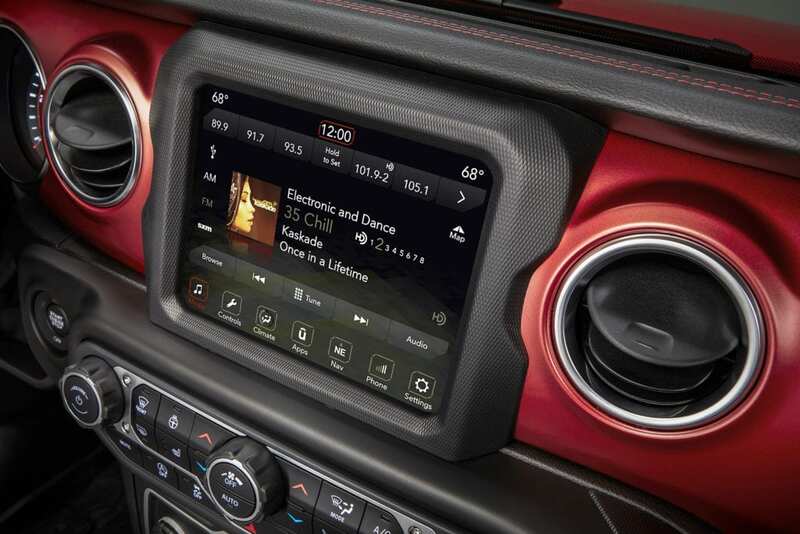 FCA and Jeep saw this coming and offer two USB connections for both front and rear seat passengers. With the phone service spotty at best in the Arizona mountains, having phones constantly searching for signal provides quite a challenge. Both myself and my ride partner found a need to be plugged in so we could maintain charge throughout the day’s drive. Would we have had a laptop with us, we could have even plugged it into a 115-volt AC outlet on-board. Now that I’ve scanned the surface of the finer features of the new 2018 Wrangler, let’s get into why off-road enthusiasts, hunters, fishermen and outdoorsmen will love it. As my drive partner and I were traversing rocks, gulleys and some of the most unfriendly terrain one can imagine we actually started singing the lyrics to the old Johnny Horton classic tune the Battle of New Orleans. “They ran through the briars, and they ran through the brambles, and they ran through the bushes where the rabbit couldn’t go.” That is truly how we felt. We were driving through territory we couldn’t have comfortably walked through. Command-Trac, Rock-Trac and Select-Trac enable the driver to go those places where a rabbit wouldn’t want to go. Command-Trac can be engaged while in motion (I don’t really like those “old-school” models where one has to stop, shift into neutral, fool with a lever and hope you get your vehicle into a correct mode). The Sport and Sahara feature a super-low (2.72:1) range for rock crawling. The Rubicon, which I took up inclines I would have thought impossible, has a 4:1 gear ratio. 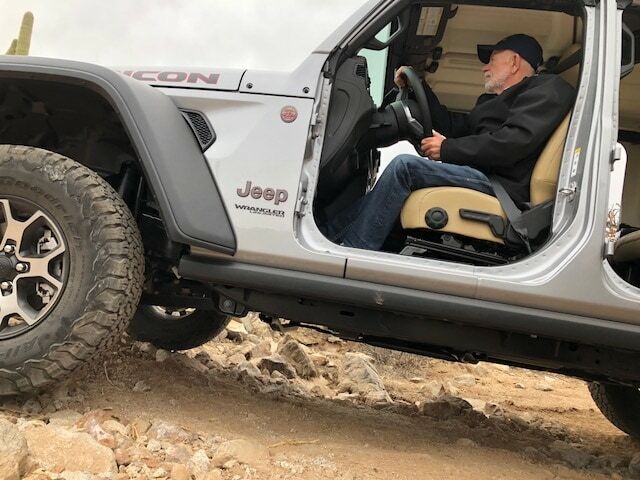 If I hadn’t been with Jeep’s superstar off-roader Nick Cappa, I would not have even dreamed of attempting to climb up and inch down terrain that I conquered. In fact, afterward, looking at the area, I admit to not knowing how I was able to negotiate such treacherous rocky peaks. 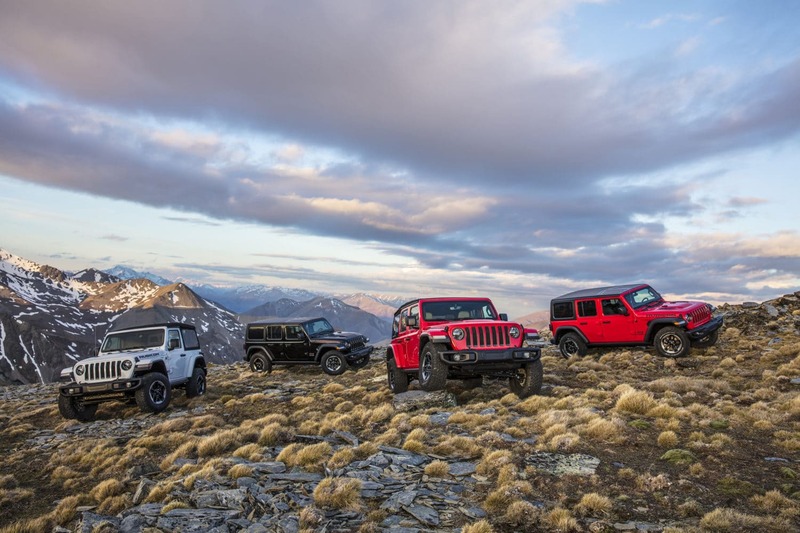 Three different power-train choices are available now on the new Wrangler: a 3.6 liter V6 Pentastar (285 HP, 260 lb.ft. torque) with a six-speed manual transmission or with an eight-speed automatic; a 2.0 liter I-4 (270 HP, 295 lb.ft. torque) with an eight speed automatic. A 3.0 liter EcoDiesel V-6 with an eight-speed automatic will be available in 2019. 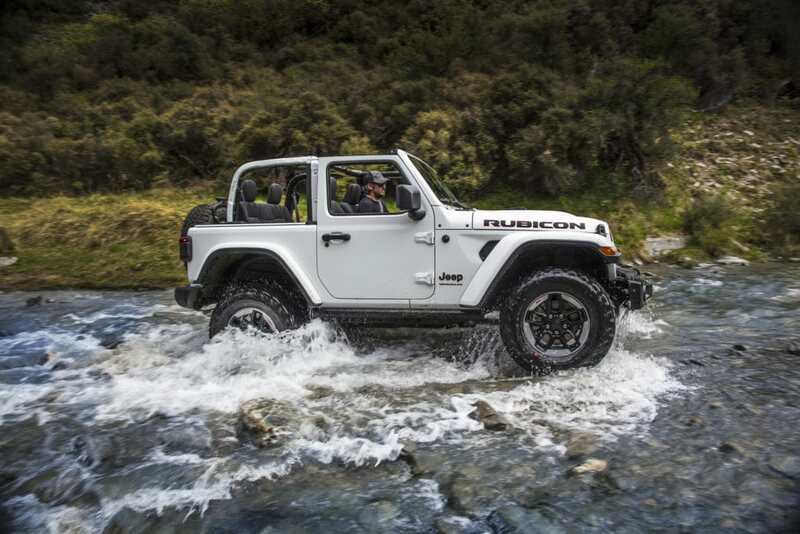 The two-door Sport model boasts an MSRP of $26,995 while the top of the line 4-door Rubicon comes in at $40,495. The 2018 Wranglers are produced in Toledo, Ohio, just as those initial models were way back in 1941.